Ken Bressett, Editor Emeritus of the Guide Book of United States Coins, shares his thoughts on “odd and curious” (primitive) money, and on Curious Currency: The Story of Money From the Stone Age to the Internet Age, Robert Leonard’s newly updated book on the subject. The use of money today is so ubiquitous that we seldom give thought to why it functions the way it does, how it came to be, or what we would do without it. People are paid for the work they do, or for their creative efforts or skills, and they spend that recompense for things they desire that have been provided to them by others. The bridge between effort, compensation, and reward is what is known as “money.” It is the necessary medium that keeps commerce functioning in an orderly manner without constantly negotiating the value of services versus products or payments. It often comes as a surprise when people leam that trade items, coins, and diverse forms of money have been used for thousands of years. An even greater revelation is that barter and trade must have played a crucial part in the early beginnings of civilized contact between prehistoric clans. The desire to exchange surplus items for different things that were needed was the driving force in establishing customs and rules about how various items should be valued and how interchanges should be carried out. The ultimate solutions became what are now inclusively known as “money.” The long road to the variety of monies used today was not a straight path. Hundreds of different items have been used to accommodate the diverse needs of everyday commerce and trade by different societies throughout the years. Some of the items that were used defy credulity. Others have stood the test of time. In its most succinct form, “money” can be anything that is acceptable to both parties in facilitating an exchange of goods or services between them. In actual use, anything and just about everything has been used as this bridge. Over the years most societies have agreed that precious metals—mainly gold, silver, and copper—are the most convenient and widely acceptable storehouses of value and thus the ideal medium of exchange for all goods and services. Even these, however, have their shortcomings. There simply is not a sufficient supply of these precious metals to serve the economic needs of the world. Throughout the years specialized needs of various societies have been met by sanctioning unique forms of exchange. Some of these defy logic by today’s standards, but are probably no more implausible than our use of electronic transfers or plastic credit cards would seem to people even one hundred years ago. The scope and variety of strange monies of the past is further complicated by a general misunderstanding of the use of these objects as trade items, ornaments of personal wealth or status, barter goods, coins, tokens, and promissory payments. In Curious Currency, with a fresh approach to understanding the nature of money in all its various forms, author and researcher Robert Leonard presents an entertaining overview of what can only be called a most unusual and bizarre assemblage of items that were once used to facilitate trade. While it is difficult to comprehend how stones could ever be used as money, they most certainly were and Mr. Leonard tells their story at length. Stone money is only one of the many unusual items he describes and shows. Author Robert D. Leonard Jr. autographing books at the American Numismatic Association World’s Fair of Money in Denver, August 3, 2017. 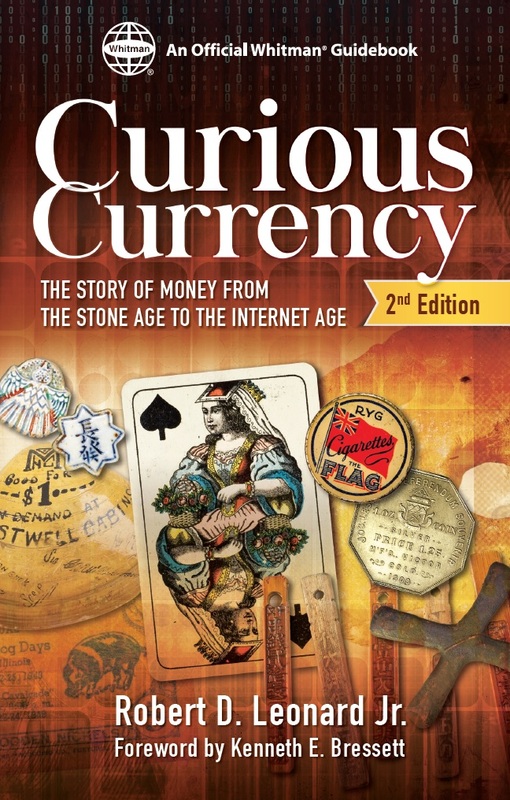 The first edition of Curious Currency earned the Numismatic Literary Guild’s prestigious “Best Specialized Book on World Coins” award. Kenneth Bressett, Editor Emeritus of the Guide Book of United States Coins, and author of award-winning books including Money of the Bible and Milestone Coins: A Pageant of the World’s Most Significant and Popular Money. The story of money, in a very real sense, is the story of world history. Not in the stuffy schoolbook sense, but when stories about money are tied to world events they speak of actual actions. Money, in the form of coins, contracts, odd objects made of shells, beads, cloth, or stone, was part of the wars, famines, growth, and glory days of many nations. A study of what has served as money, past and present, can help everyone better understand its nature and use through prosperous and troubled times, and how it functions today. When some Neolithic man fashioned the first useful stone or flint tools they must have quickly become coveted trade items that could be exchanged for the surplus food gathered by other clansmen. Little could these early people realize that this convention was to be the beginning of commercial transactions that would impact the entire world and nearly every facet of life thereafter. Such primitive exchanges were scarcely much different than the bartering that went on in America when the Forty Niners left their homes and traveled to California in search of a golden dust that they could trade for whatever luxuries they wanted. Only a few hundred years ago, in the days when much of America was still a British colony, tobacco, lumber, furs, musket balls, and beads took the place of scarce silver and gold coins. At that time barter with farm products, known as “country pay,” served our ancestors well for many years. It is, in fact, still used to some extent today in rural communities. Knowledge of how the various forms of money served economic needs in the past may hold clues as to how money should be regarded today, and how people can cope with the universal concerns about inflation, credit problems, management of wealth, and governance. Mr. Leonard’s provocative study of how hundreds of societies have adapted to using nonstandard items to meet their needs can only lead to the conclusion that most forms of money and wealth are based on faith, and in the end may all be ephemeral. What many students term as “odd and curious,” “primitive,” “strange,” or “traditional” money, is really not so bizarre after all. It was only through a combination of chance and necessity, that at some time and place some societies preferred to use feathers or stones rather than to rely on electronic blips or pieces of paper. ISBN 0794846394. Hardcover, 6×9 inches, 160 pages, full color, retail $16.95 U.S.